This is an archontological list of Serbian monarchs, containing monarchs of the medieval principalities, to heads of state of modern Serbia. Stefan Uroš IV Dušan, known as Dušan the Mighty, was the King of Serbia from 8 September 1331 and Emperor and autocrat of the Serbs, Bulgarians, Greeks and Albanians from 16 April 1346 until his death. Dušan conquered a large part of southeast Europe, becoming one of the most powerful monarchs of the era. 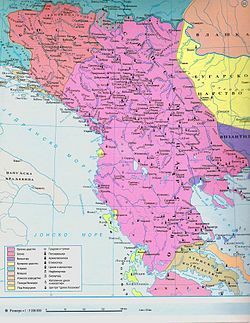 Under Dušan's rule, Serbia was the major power in the Balkans, and a multi-lingual empire that stretched from the Danube in the north to the Gulf of Corynth in the south, with its capital in Skopje. He enacted the constitution of the Serbian Empire, known as Dušan's Code, perhaps the most important literary work of medieval Serbia. 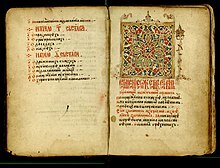 Dušan's Code is a compilation of several legal systems that was enacted by Stefan Uroš IV Dušan of Serbia in 1349. It was used in the Serbian Empire and the succeeding Serbian Despotate. It is considered an early constitution, or close to it; an advanced set of laws which regulated all aspects of life. 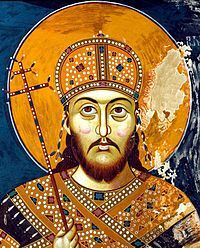 Saint Stefan Uroš V, known in historiography as Uroš the Weak, was the second Emperor (Tsar) of the Serbian Empire (1355–1371), and before that he was Serbian King and co-ruler with his father, Emperor Stefan Dušan. The Hilandar Monastery is one of the twenty Eastern Orthodox monasteries in Mount Athos in Greece. It was founded in 1198 by Stefan Nemanja, former Grand Prince of Serbia (1166-1196), who upon relinquishing his throne took monastic vows to become the ordinary monk Symeon, soon joining in Mount Athos his son Saint Sava, who later became Archbishop of Serbia. Upon foundation, monastery became a focal point of Serbian religious and cultural life, as well as "the first Serbian university". It is ranked fourth in the Athonite hierarchy of 20 sovereign monasteries. The Mother of God through her Icon of the Three Hands (Trojeručica), is considered the monastery's abbess. The Nemanjić was the most prominent dynasty of Serbia in the Middle Ages. The princely, royal and imperial house produced Ten Serbian monarchs between 1166 and 1371. Ivan Alexander, also sometimes Anglicized as John Alexander, ruled as Emperor (Tsar) of Bulgaria from 1331 to 1371, during the Second Bulgarian Empire. The date of his birth is unknown. He died on 17 February 1371. The long reign of Ivan Alexander is considered a transitional period in Bulgarian medieval history. Ivan Alexander began his rule by dealing with internal problems and external threats from Bulgaria's neighbours, the Byzantine Empire and Serbia, as well as leading his empire into a period of economic recovery and cultural and religious renaissance. Konstantin Dejanović was a Serbian magnate that ruled a large province in eastern Macedonia under Ottoman suzerainty, during the fall of the Serbian Empire. He succeeded his older brother Jovan Dragaš, who had been an Ottoman vassal since the Battle of Maritsa (1371) which had devastated part of the Serbian nobility. The brothers had their own government and minted coins according to the Nemanjić style. His daughter Jelena married Byzantine Emperor Manuel II Palaiologos in 1392. He fell at the Battle of Rovine, serving the Ottomans against Wallachia, fighting alongside Serbian magnates Stefan Lazarević and Marko Mrnjavčević. Serbia in the Middle Ages refers to the medieval period in the history of Serbia. The period begins in the 6th century with the Slavic migrations to Southeastern Europe, and lasts until the Ottoman conquest of Serbian lands in the second half of the 15th century. The period is also extended to 1537, when Pavle Bakić, the last titular Despot of Serbia in Hungarian exile, fell in the Battle of Gorjani. Simeon Uroš, nicknamed Siniša (Синиша), was a self-proclaimed Emperor of Serbs and Greeks, from 1356 to 1370. He was son of Serbian King Stefan Dečanski and Byzantine Princess Maria Palaiologina. Initially, he was awarded the title of despot in 1346, and appointed governor of southern Epirus and Acarnania in 1347 by his half-brother, Serbian Emperor Stefan Dušan. After Dušan's death in 1355, Serbian throne passed to Dušan's son Stefan Uroš V, but despot Simeon decided to seize the opportunity in order to impose himself as co-ruler and lord of all southern provinces of the Serbian Empire. That led him to conflict with his nephew in 1356, when Simeon started to expand his control in southern regions of the Empire, trying to take Thessaly and Macedonia. He proclaimed himself Emperor of the Serbs and Greeks, creating a separate state, centered in regions of Thessaly and Epirus, where he ruled until death in 1370. 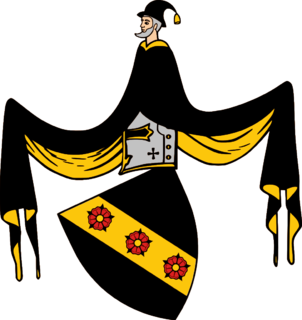 He was succeeded by his son Jovan Uroš. Uglješa Mrnjavčević, known as Jovan Uglješa (Serbian Cyrillic: Јован Угљеша, was a Serbian medieval nobleman of the Mrnjavčević family and one of the most prominent magnates of the Serbian Empire. He held the title of despot, received from Serbian Emperor Stefan Uroš V, whose co-ruler - Serbian King Vukašin was brother of Uglješa. Dejan was a Serbian magnate who served Emperor Stefan Dušan as sevastokrator, and Emperor Uroš V as despot. He was married to Emperor Dušan's sister Teodora, and possessed a large province in the Kumanovo region, east of Skopska Crna Gora. It initially included the old župe (counties) of Žegligovo and Preševo. Uroš V later gave Dejan the Upper Struma river with Velbužd (Kyustendil). Dejan built the Zemen Monastery, among others, and reconstructed several church buildings throughout his province. Between 1345 and 1371, the Serbian monarch was selftitled emperor (tsar), the full title being Emperor of the Serbs and Greeks and Bulgarians in Serbian and basileus and autokrator of Serbia and Romania ["the land of the Romans"] in Greek. This title was soon enlarged into "Emperor and Autocrat of the Serbs and Greeks, the Bulgarians and Albanians". The Serbian Empire was ruled by only two monarchs; Stefan Dušan and Stefan Uroš V. Two other claimants of the title ruled in Thessaly, Central Greece. The Kingdom of Serbia, or Serbian Kingdom, was a medieval Serbian state that existed from 1217 to 1346, ruled by the Nemanjić dynasty. The Grand Principality of Serbia was elevated with the coronation of Stefan Nemanjić as king by his brother, archbishop Sava, after inheriting all territories unified by their father, grand prince Stefan Nemanja. The kingdom was proclaimed an empire on 16 April 1346. The fall of the Serbian Empire was a decades-long period in the late 14th century that marked the end of the once-powerful Serbian Empire. Following the death of childless Emperor Stefan Uroš V in 1371, the Empire was left without an heir and the magnates, velikaši, obtained the rule of its provinces and districts, continuing their offices as independent with titles such as gospodin, and despot, given to them during the Empire. This period is known as the dissolution or the beginning of the fall of the Serbian Empire. The Dejanović or Dragaš, originates from a medieval noble family that served the Serbian Empire of Dušan the Mighty and Uroš the Weak, and during the fall of the Serbian Empire, after the Battle of Maritsa (1371), it became an Ottoman vassal. The family was one of the most prominent during these periods. The family held a region roughly centered where the borders of Serbia, Bulgaria and Macedonia meet. The last two Byzantine Emperors were maternal descendants of the house. Saint Sava, known as the Enlightener, was a Serbian prince and Orthodox monk, the first Archbishop of the autocephalous Serbian Church, the founder of Serbian law, and a diplomat. Sava, born as Rastko, was the youngest son of Serbian Grand Prince Stefan Nemanja, and ruled the appanage of Hum briefly in 1190–92. He then left for Mount Athos, where he became a monk with the name Sava (Sabbas). 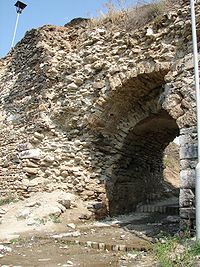 At Athos he established the monastery of Hilandar, which became one of the most important cultural and religious centres of the Serbian people. In 1219 the Patriarchate exiled in Nicea recognized him as the first Serbian Archbishop, and in the same year he authored the oldest known constitution of Serbia, the Zakonopravilo nomocanon, thus securing full independence; both religious and political. Sava is regarded as the founder of Serbian medieval literature. Uglješa Vlatković was a Serbian nobleman from the late 14th and early 15th centuries. He had the title of kesar (caesar) and ruled over the area of Inogošt, Preševo and Vranje. The Serbian civil war of 1331 broke out following King Stefan Uroš III's decision not to continue campaigning against the Byzantine Empire when he had the chance following the victory at the Battle of Velbazhd against Bulgaria, alienating much of the nobility, which became divided supporting either Uroš III or his son, Stefan Dušan.